FLIGHT MH17 – Kiev Flash Mob’s Final False Flag? The downing of Flight MH17 means that Washington’s gang are on the war path again. Barack Obama, Joe Biden, John McCain and even Hillary Clinton – are all insisting that the west has to ‘get tougher’ with Russia. Was this the plan all along?With little or no evidence to back their claims (déjà vu Syria), the usual suspects and their media moguls are pointing the finger at Russia again. With so much going on in the US and to its special friends in other parts of the world, this crisis event could not have come at a better time. Is this the Kiev Flash Mob’s final card from its dealer at Pennsylvania Ave?Escalating To WarAs any keen observer of the event will tell you, nothing about Washington’s version of events adds up. Reactions were predictable. 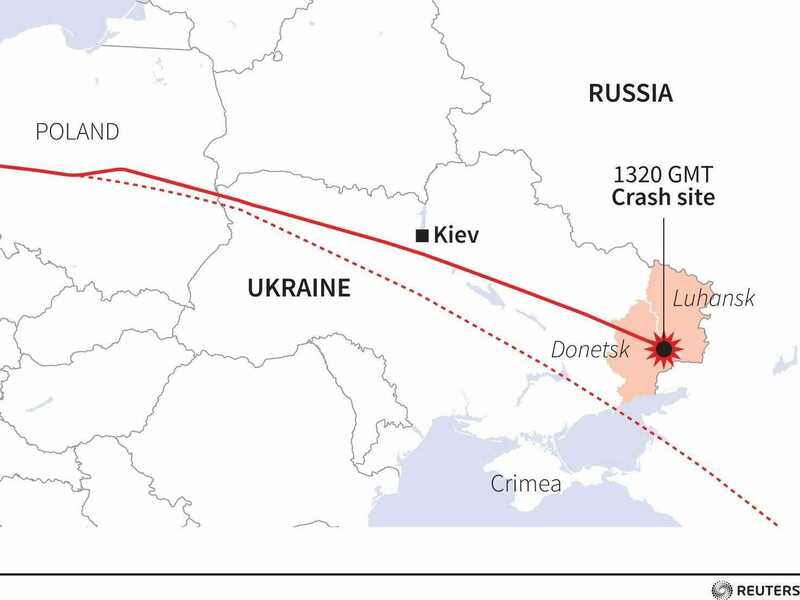 Financial markets reacted with a predictable knee-jerk massive gold­ and­ oil price spike, to news of the mid-­air destruction by missile or (theoretically­ only) by an on-board bomb explosion, of Malaysian Airlines flight MH17 near Donetsk in Ukraine. The recent ­model Boeing 777 is said to have had 298 persons on board, all of whom died. Known data on the flight, until it suddenly went off-­air, is that the flight was progressing normally at the plane’s design cruise speed (about 0.84 Mach or 1000 kilometres/hour), and its normal cruise altitude of 10,000 metres or 33,000 feet. launched air defence missile systems like the US ‘Stinger’ or French ‘Mistral’ have a maximum altitude around 4,000 metres for destroying or in the case of large airplanes, severely damaging enemy aircraft. Air-­to-­air missiles (AAM) also able to completely destroy large aircraft at high altitudes need highly sophisticated airplanes, pilots and ground radar support, which are totally outside rebel capacities. The only unknown on the military technology side, therefore, is whether the pro-Russian rebels possess sophisticated SAM air defence missiles, or not. SAM systems have been used in the past by Ukrainian military to destroy civil airliners – by error – and include the advanced BUK air defence system, which has been continually developed firstly by the ex-­USSR, then by Russia since 1979 to counter similar materiel in the NATO countries. Incredibly, Kiev spokespersons immediately claimed that BUK missiles had been used by the rebels to destroy the Malaysian plane, set a false flag, and further “up the ante” in the escalating civil war process. There evidence for this claim is less than impressive – a 5 second YouTube video, seen here. Proving that Kiev, under the direction of the CIA (the CIA have set-up a station occupying the entire top floor of the Ukrainian Ministry of Defense in Kiev) later the same day, Thursday 17 July, they claimed that Russia had used its aviation and AAM weapons to destroy the jetliner. Normally, this would hurt the credibility of Kiev’s finger-pointing, but this was completely black-out of US media and State Department reports, or ‘memory holed’ for expediency of the prevailing narrative being managed by Washington DC. The motive for this cynical and criminal act – destroying a civil jetliner – underscores the role of “false flags” to rouse and manipulate public opinion in the supposedly “neutral” US and the EU28 countries. 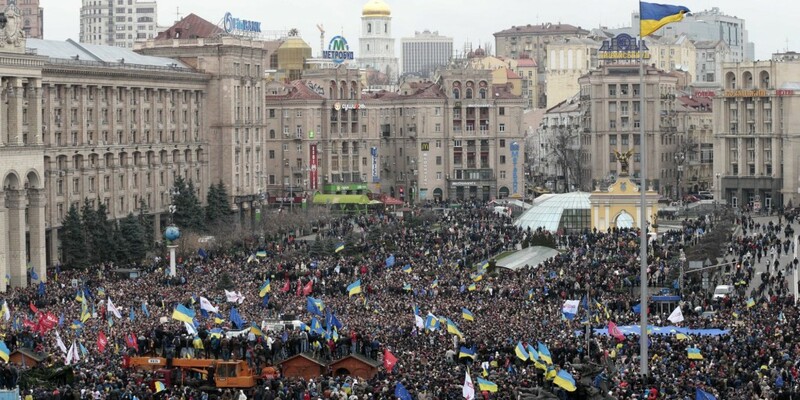 Drawing their political leaderships into the next – international – phase of the Ukrainian civil war is “logical” for the Kiev flash mob government given its lack of success, either military or political, in obtaining full control of separatist regions in eastern Ukraine. Cynically destroying a large civil airliner and killing nearly 300 people is, to be sure, “war logic” but as the 1915 Lusitania incident showed, these incidents can spark a one­-way process to all­-out international war. Single incidents of deliberate attack on civil transport able to cause or accelerate the declaration of war by previously neutral countries due to the death of their citizens in the attack include the renowned Lusitania maritime incident of May 1915. The British asset Lusitania passenger ship traveling from New York to Liverpool, was sunk off Ireland, allegedly by a German U-­boat with 138 Americans among the 1198 total of persons killed. Following this incident it became politically impossible for US President Woodrow Wilson, who had sought to stay neutral, to avoid declaring war against Germany. As we know today, the US political stance on the Ukrainian civil war is that of outright hostility towards Russia and the ‘pro­-Russian’ rebels seeking some level of either recognition or autonomy from the pro-fascist and NATO-backed regime which came to power by a Flash Mob and paramilitary coup in February. Hence, Washington-Brussels-London-Kiev Axis has conveniently labeled any opposition as “terrorists”, specifically those in eastern Ukraine who seek independence from Kiev and do not recognize the Kiev government. While there is no certainty the ‘pro­-Russian’ rebels hold advanced SAM air defence weapons, they are certainly in the hands of the Kiev flash mob government, alongside the advanced AAM weapons they also “inherited” from the elected government they overthrew. In a sane world, based on facts and forensic evidence, the onus of military proof should be stacked against Kiev, leaving only the question of political motive (or motives) for the incident, but as anyone who has followed this civil war closely will tell you, there is nothing sane about how the junta in Kiev was formed, or how it’s held onto power since its installation by the US State Department planners. The timing of this plane incident is almost uncanny. Israel-watchers can also point to the near ­simultaneous Israeli ground invasion of Gaza, and the MH17 disaster, which swivels attention away from what will necessarily and inevitably be a gory and murderous phase of the decades-­long and never resolved Palestinian-­Israeli conflict. Recent events in the ever ­escalating military conflict in eastern Ukraine now feature regular downings of military airplanes by the rebels due to the Kiev flash mob government using its military aviation for attack on supposed “rebel concentrations” – when in realty Kiev is using it’s NATO-refreshed military to attack civilian targets all over eastern Ukraine which has now forced over 500,000 refugees over the border into Russia – a fact which has been ignored by the US government and its media outlets because it does not square with the narrative Washington has been pumping up since hostilities began in February. Kiev’s use of its airforce to attack civilian targets avoids the use by Kiev of its ground forces, who have already repeatedly defected to the rebels’ side in recent weeks, with their weapons – as has been the case in Iraq. Totally destroying a large civil airliner flying at 10,000 metres, however, marks a major military, as well as political escalation on the part of the culprits. Recent military-linked aviation incidents have included one destruction in flight of an advanced Su­25 fighter, an incident in which the Ukrainian pilot was able to eject. The main difference is that these military actions concerned much smaller aircraft and took place at much lower altitudes than the destruction by high altitude missile strike, of flight MH17. Ground debris with few fragments larger than 3­feet length, reminds observers of air disasters like the Sept 11, 2001 downing in Pennsylvania of United Airlines flight 93, a Boeing 757, which with no possible doubt was caused by mid-­air explosion – either by advanced missile strike, or more likely, onboard explosives. In this second hypothetical case, the quantities of HE-­high explosives needed would be considerable. We are now deliberately placed in a darkening context of rumors and counter-­rumors, bizarrely articulated by Twitter and YouTube comments, factoids and false flag video clips. The “false flag war” run by US and western intelligence against Russia is now constant. Nearly a year ago, YouTube clips wheeled out by US Secretary of State John Kerry “proving” the Assad regime used toxic sarin gas against its own Syrian civilians, as well as Saudi-­financed rebels later gave way to actual evidence – that the videos of children were faked, and that the gases had been made in, or supplied by the UK, as well as material originating in Saudi Arabia. 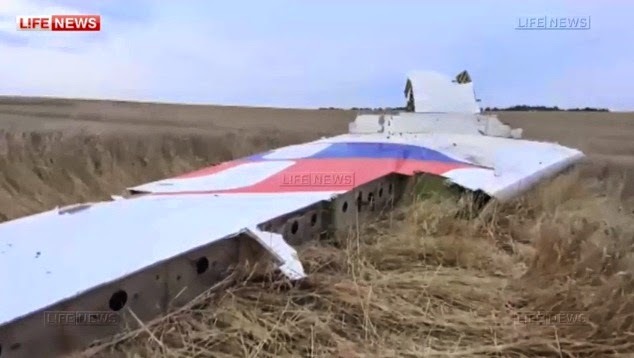 Late Thursday night, 17 July, a Kiev­ origin clip on YouTube mixed and melded the Su­25 military airplane downing – an incident in which the fighter plane was seriously damaged, only – with the total destruction of flight MH17. The clip presents alleged recordings of a conversation between a pro­Russian separatist and his coordinator Vasyl Geranin, claimed to be a colonel in the Intelligence Directorate of the Russian Army. Their conversation concerns an airplane that is forced to the ground but the translated version does not distinguish whether this was a civilian or a military jet, and may well concern the Ukrainian Su­25 in an incident which the Kiev flash mob government first claimed to be action by pro­Russian rebels using Russian-­supplied anti aircraft missiles. In that Su­25 incident, Russia promptly denied any involvement. Later on in the same clip, it ends with another conversation this time between an unidentified, purported rebel leader and a claimed Cossack militant operating in eastern Ukraine, backing the rebels. The Cossack says that markings on the wreckage of MH17 clearly show it is a civil airliner – claiming to say pieces of wreckage are so large that “Malaysian Airlines” can be easily read. This is technically almost impossible following the total destruction at high altitude of any type of plane, followed by its wreckage falling to ground by gravity and further dislocating while doing so. Like the Ukraine, Syria is a high-stake geopolitical game. Claimed motives as to why Vladimir Putin’s Russia never wavered in its political support to the Assad regime included the “Qatar gas pipeline” story – in other words the false flag of Syrian toxic gas utilization was fabricated in order to create western public support for the overthrow of Bashr al Assad and the later building of a gas pipeline across Syria bringing “friendship gas” from US ally Qatar’s giant gas field to Europe via a Mediterranean port. In theory, this could seriously dent Gazprom’s “stranglehold” on the lucrative European gas market, resulting in Putin backing Syria’s Assad. Follow the gas, follow the real narrative. If you know who the real aggressor is in this drama then you can guess what’s coming next. The false flag war will evidently continue, and become even more violent and bizarre.